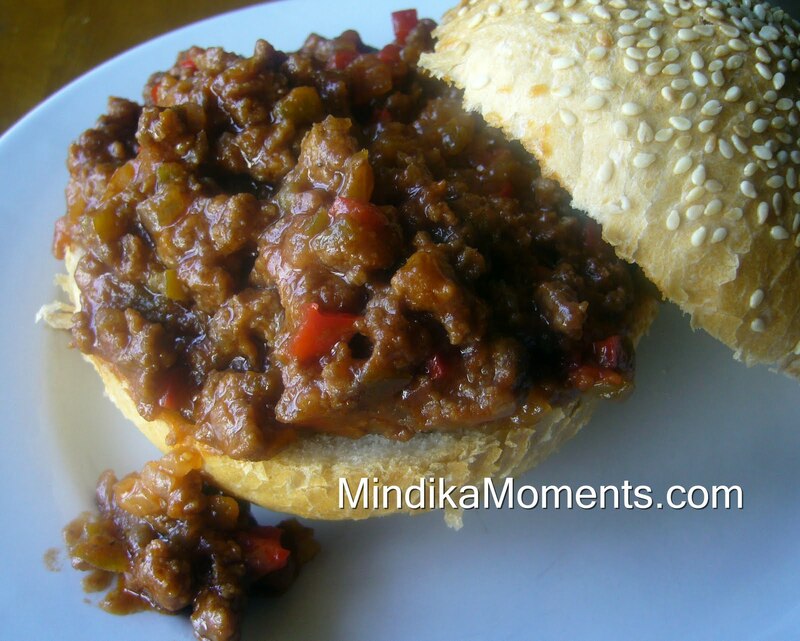 Mindika Moments: Definitely not your high school cafeteria's Sloppy Joe! Definitely not your high school cafeteria's Sloppy Joe! My husband loves Sloppy Joes. I however, an not a huge fan. For some reason they dredge up memories of a school cafeteria, with greasy meat, no flavor and soggy buns. My mom made pretty good Sloppy Joes, but I don't remember her making them a whole lot, so they never really became a regular on my dietary love list. But there's nothing I love better than pleasing my man in the kitchen, so we eat them on a regular basis. That's why I decided to come up with my own recipe. Something made with fresh ingredients, lean meat and plenty of veggies. I also love them on a good hard roll. Have you tried the hard rolls from the new Winco? Fresh from the bakery, they are pretty darn close to the hard rolls we used to buy from the bakery, when I lived in Germany. I highly recommend them with this recipe. Enjoy! 1. In a large skillet heat the olive oil over medium high heat. 2. Add the carrots, celery, peppers, onion, garlic and the beef. Brown until the meat is done and the veggies are tender. Season with salt & pepper as they cook. 3. Add the tomato sauce, ketchup, mustard, Worcestershire sauce, brown sugar and vinegar. Stir to combine. 4. Bring to a boil, reduce heat and allow to simmer for about 5 minutes or until all the flavors come together. 5. Serve with hamburger buns or a hard roll. I've been eying this recipe for sometime. I love sloppy joes, but my hubby isn't a big fan! I may whip these up anyway. I'll let you know how it went. I will definitely try your sloppy joes. We eat them often here too along with a coleslaw topping (the way Grumpy grew up with them!) I love the sauce ingredients - I have a feeling this could be the way I do sloppy joes from now on instead of being lazy and making Manwich! But I need to mention something important.. My grade school cafeteria made Great food, and everything was done from scratch. I wish I could go back and thank those women! They obviously really cared. The sloppy joes were great, and the buns were homemade. They made homemade pizza too, cutting out the dough with coffee cans.. I really don't know how they had the time. We were very lucky. After 5th grade, we moved, and my new school had awful food that was bland, with nothing made from scratch.